Unfortunately, this same kind of story is still happening to people all throughout America. In the 1970s the US embassy in Iran was overrun. Before it was overrun, the embassy was in a hostage situation, and the embassy employees, who were unable to burn certain documents, had to make do with a low quality strip cut paper shredder. Later on, Iranian basket weavers were able to reassemble the documents. You can find a picture of these papers at the bottom of this page. So how does a cross cut shredder work? Quite simply, it will reduce your personal documents into small particles, little more than confetti. Hence its nicknames: the confetti cut shredder, or the particle cut shredder. Its best feature is guaranteeing that your business documents will be shredded safely. As the story above shows, a strip cut paper shredder doesn’t always ensure that your personal information is kept safe. Cross cut shredders were expensive and considered as exotic back then, but not anymore. Now, it’s much easier to get one to take care of all your security needs. If strip cut shredded papers can be reassembled, as the story above proves, then you can see why garbage snoopers are a cause for concern. Because of them, you have to shred papers, and you have to shred them well. While you might be thinking that cutting up papers or credit cards using scissors is good enough, it really isn’t. It’s true that most thieves won’t bother to put the pieces back together, but, then again, some will. In fact, there are real cases of credit card applications being pieced back together and then mailed in, and actually getting accepted! These cases show that ripping them up doesn’t work. Now that you know why you need a cross cut shredder, we’re going to answer the question that everyone’s now asking: “how does a cross cut shredder work”? First of all, cross cut shredders aren’t just for papers. A micro cut shredder can also cut up credit cards and cds/dvds into finely cut parts that are smaller than ants. Cross cut shredders are classified based on the size of the particle. The particle size is what defines the security level of the shredder. Keep this in mind too: the smaller the shredded paper particles are, the less sheets that can be shred at a single time. This is because of the stress that’s put on the motors. This is one major limitation on store bought cross cut paper shredders. For the highest level of security and convenience, there’s nothing better than a mobile paper shredding service that offers NAID (National Association of Information Destruction) sanctioned high-security shear shred. 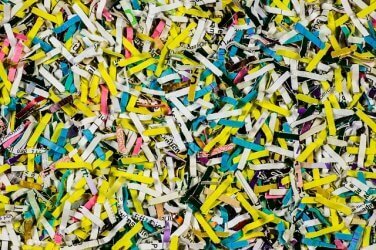 See our article on onsite document shredding to learn more.